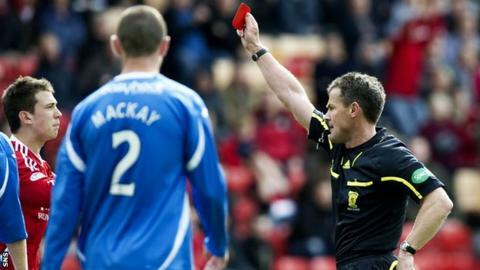 Former top-flight referee Steve Conroy has called on Scotland's professional clubs to face sanctions for the misbehaviour of their fans. Clubs are ruled by 'strict liability' when competing in European competitions but not domestically. Conroy thinks such a rule would help prevent problems like those at this week's Edinburgh derby at Tynecastle. "If there's repeat offenders, do you start banning supporters, do you have empty stands?" he told BBC Scotland. "It is up to the clubs to stop them. It is their liability and it's up to the other fans to be policing people among them. "There has to be some kind of sanction to stop people doing this and if it falls on the clubs and they've got the threat of empty stadiums or revenue being taken off them then maybe that'll make people think more forcibly about it." Five people have been arrested following Wednesday's game, where Hibs head coach Neil Lennon was struck by a coin, Hearts goalkeeper Zdenek Zlamal claims he was punched by a fan and both assistant referees were struck by missiles. Assistant referee Calum Spence was also hit by a coin during Livingston's Scottish Premiership game against Rangers last month and Conroy is concerned that incidents targeting officials are becoming more commonplace. "It is getting out of order," he said. "Is there a way of guaranteeing anyone's safety absolutely? When you've got people involved and spectators, no. But there's certainly a lot more that can be done than is currently." Conroy is pleased that there is already talk of stronger stewarding and additional policing but said clubs and fans themselves had to take greater responsibility. He suggested that spectators found guilty of offences should be "banned for life instantly" but stressed that "there has to be a sanction beyond that". Conroy also pointed out that at junior and children's games "you've got nobody there to protect officials". Former Scottish FA chief executive Gordon Smith also believes that strict liability might be "very important" in encouraging fans, who might otherwise be wary of reporting aggressive troublemakers, to take action if it means their team losing points, being thrown out of a competition or being fined. League Managers Association in Scotland chairman Billy Brown said: "These are thugs that have got to be rooted out because we can't have it in Scottish football and, if this was in Europe, the repercussions would be vast - they'd probably close the ground." Meanwhile, Paul Goodwin, of the Scottish Football Supporters Association, has called for a summit of governing bodies, authorities and fans to "help eradicate this problem before it escalates", saying he believes "self-policing" by fans is the way forward. His organisation has asked former First Minister Henry McLeish to chair such a meeting. However, Professor Clifford Stott, an expert in policing football grounds, has warned that it is important not to overreact. "We've got to recognise that football is, of itself, a passionate sport," he said. "Part of the reason we enjoy football so much is because it has an atmosphere and it has an atmosphere because there is an edge and tension between football fans and the clubs. "It is about keeping the management of that tension in line with an approach that doesn't see it tipping out into the kind of missile throwing and hostilities that we know to be very negative."